H 48" x W 60" x D 7"
Railroad tracks and underlying templates denote depots along the Underground Railroad as well as the great migration of African Americans from southern cities and states to northern cities and states. The book cover and spine of "The Remarkable Advancement of the Afro-American" aka "Progress of a Race", published in 1897, written by William Crogman with an introduction by Booker T. Washington, highlights the importance of education in African Americans lives during the period following slavery. The copy of an envelope in the upper left and lower right corners are scriptures and prayers of the wife in the photo, scanned from an actual envelope and enlarged. Circuit boards are a metaphor for the currents in African Americans lives from the time of their ancestors being shipped throughout the African Diaspora till today. Currents of water, electricity, air, events, travel and time. 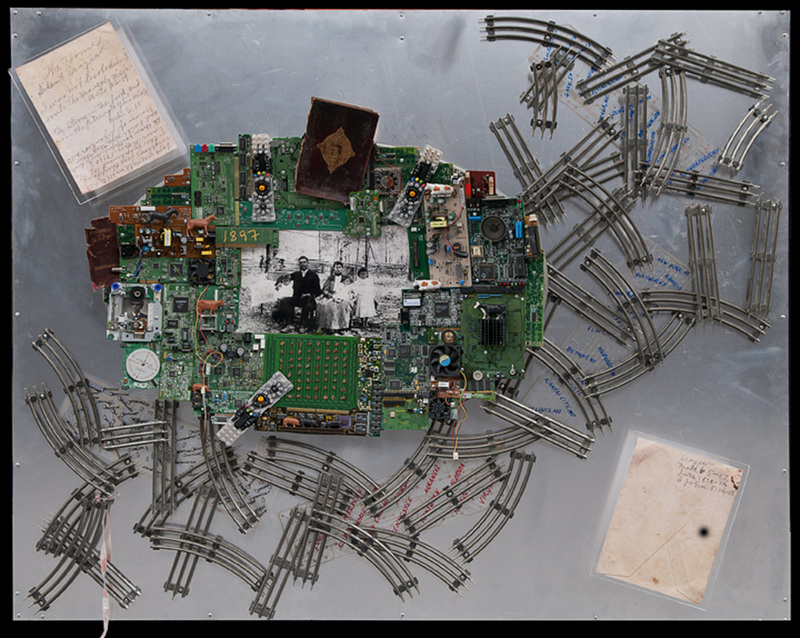 Circuit boards also represent the "brain" power of computerized devices and are metaphors for the intelligence, strength, creativity and power of African Americans in their struggle for freedom. And last but not least, circuit boards are metaphors for, "Currents", threads running through all of our lives connecting us to each other. Photo: African American family circa 1897, Galilee (aka Harmony), Mississippi. Railroad tracks and underlying templates denote the great re-migration of African Americans from northern cities and states to southern cities and states, highlighting education and HBCU's (Historically Black Colleges & Universities). The poem in the upper right corner is taken from the book "The Remarkable Advancement of the Afro-American" published in 1897, written by William Crogman with an introduction by Booker T. Washington. The poem is, We Are Rising, by Rev. George C. Rowe. Circuit boards are a metaphor for the currents in African Americans lives from the time of their ancestors being shipped throughout the African Diaspora till today. Currents of water, electricity, air, events, travel and time. 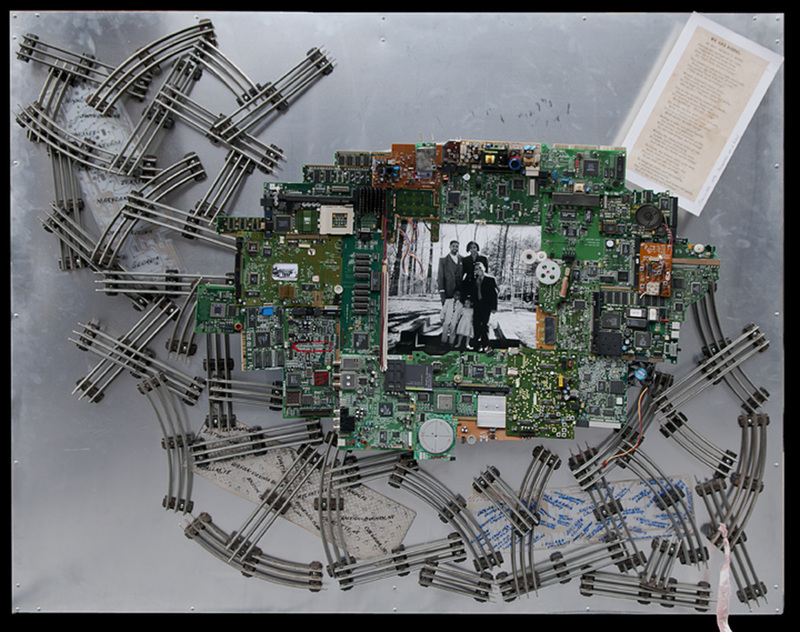 Circuit boards also represent the "brain" power of computerized devices and are metaphors for the intelligence, strength, creativity and power of African Americans in their struggle for freedom. And last but not least, circuit boards are metaphors for, "Currents", threads running through all of our lives connecting us to each other. A graduate’s tassel represents the importance of education in African Americans lives in their efforts to become free. Photo: African American family circa 1997, Atlanta, Georgia.